Welcome to the Wheatley School Alumni Association Newsletter Number Thirteen. All prior iterations are available at http://www.wheatleyalumni.org/ I believe that many of you did not receive Number Eleven (11). Please check out: http://www.wheatleyalumni.org/Blogpost/Blogpost-20170212.html Note that all submissions herein have been slightly edited. Mr. Wathey and I recently spoke on the occasion of his 93rd birthday. He says that his body has slowed up some (due in part to a World War II combat wound! ): but I can attest that his mind is still sharp as a tack. He continues to refer to us “The Kids”; I am 68, and many graduates are several years older. We are “in his thoughts and prayers.” Years ago he authorized me to give out his e-mail address upon request, so if you want to contact him, just let me know. My daughter Diana died during surgery for the treatment of a venous malformation. She was 41 years old and leaves behind a husband and two children, aged 16 and 12. Diana survived critical injuries in the accident that took my daughter Julie's life 20 years ago. Julie died on April 6th. which in that year was Good Friday. Diana died on April 10th, also within the Holy Season of Easter. We were in Colorado for 8 days. Five hundred people attended her funeral service. After graduating from Rutgers, New Brunswick she married and became a full-time mother. It was what she always wanted. She was the warmest, friendliest, most loving person I have ever known. Five hundred people showed up because of that. When I hugged her I felt her warmth radiate into my body. She was so very comforting. I had four children and now I have two. I am on another path of reconciliation with the loss of yet another child. The Lord had prepared a path for me. He helped me make the decision to join The Unity Choir. It consists of voices from all the churches in Sussex County, New Jersey, who sing. We have upwards of 60 voices, with professionals who accompany us as soloists. This year we performed the Sjabat Mater dolorosa. It is recognized as the 4th greatest Latin hymn ever written. It is about Mary's agony at the base of the cross and then her joy as she realizes that Jesus has risen to Paradise. I am also enrolled in a Parish Nursing ANA-approved program that is a chaplaincy at the College of St. Elizabeth in Morristown. The Lord has cloaked me in faith-based commitments. These two things the Lord gave me to comfort and guide me. You may publish this. My desire to remain outside the circle of left-minded people remains unchanged, but I do want my high school companions to know of the loss of Diana Margaret Kerby. I called Julie "My Julie who brings Joy" and now she has her sister with her in Heaven. Justin Theroux and Jennifer Aniston at the Premiere Of HBO's "The Leftovers" Season 3 at Avalon Hollywood on April 4, 2017 in Los Angeles, CA. A “game of inches” is a phrase used to describe football, but it can apply to legal matters as well. 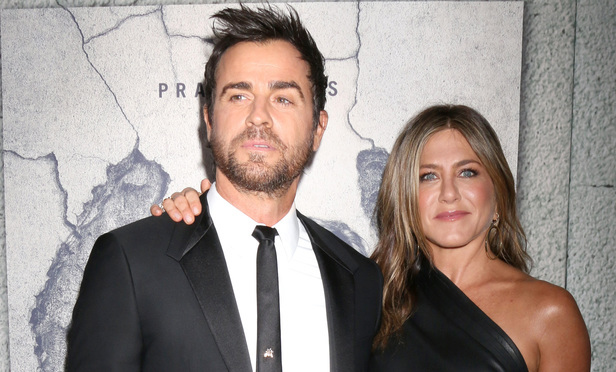 One such case might be the suit filed last week by actor Justin Theroux against attorney Norman J. Resnicow, his downstairs neighbor at the Greenwich Village building where the star of HBO’s “The Leftovers” sometimes lives with his wife, Jennifer Aniston. The suit, filed in New York Supreme Court, alleges that Resnicow, a partner at the New York law firm of Fox, Horan & Camerini, has used his lawyerly skills “to bully and intimidate Mr. Theroux.” As a dispute over Theroux’s renovations escalated, Resnicow retaliated by redrawing the boundary line dividing their shared roof deck, the suit alleges. Theroux originally acquired his second-floor unit 2A in 2001 and the adjacent 2B unit in 2003. Resnicow moved into the apartment directly below 2A in 2004. It was in 2015, when Theroux began a renovation approved by the co-op board and the city, that the real trouble began. With the work underway, Resnicow insisted that Theroux install high-end soundproofing that would cost roughly $30,000 more than that which the actor had planned, the suit claims. When Theroux refused, things got nasty. The suit states that Resnicow, “seizing on his legal training,” engaged in pointless objections, threatened litigation and bombarded Theroux’s agents with correspondence loaded with legalese and bearing his law firm’s standard confidentiality notice at the bottom. The suit also alleges that the attorney cut off Theroux’s access to a water line for his outdoor terrace, killed the ivy (which Theroux particularly enjoyed) separating their sides of the roof deck, made false damage claims and demanded the actor replace the original century-old radiator in his apartment. Theroux seeks $350,000 plus interest in damages. Now, in what could pass as a parody of a New York real estate fight, the neighbors are warring over the line that divides a shared roof deck. In late 2015, Resnicow claimed to have researched the exact location of the boundary and accused Theroux of encroaching by two feet. Resnicow laid out bricks to mark what he considered the proper dividing line. “Each time another party removed the bricks Attorney Resnicow replaced them in the same location,” states Theroux’s suit. Theroux calls the dispute a “land grab.” The new boundary, the suit says, would require him to leap off the final step of the stairs approximately 10 inches to reach his roof deck. Besides all the heated back-and-forth between the principals, there’s an awkward personal aspect to the suit: Resnicow, a former Baker McKenzie partner who left that firm in 1998, is a former colleague of Theroux’s father, Eugene “Gene” Theroux, an attorney who spent 44 years with Baker McKenzie. Resnicow also said Monday that he had retained New York attorney Peter M. Levine to represent him in the case. Theroux’s attorney, Eric Sherman of Pryor Cashman, declined to comment on the case. 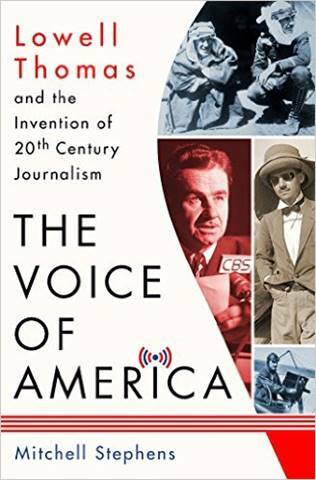 You can obtain your very own copy thusly: https://www.amazon.com/Voice-America-Invention-20th-Century-Journalism-ebook/dp/B01MRQY3SW/ref=dp_kinw_strp_1. Also, Politico, the online magazine, just published an essay of his: http://www.politico.com/magazine/story/2017/06/26/goodbye-nonpartisan-journalism-and-good-riddance-215305. And, certainly not least, his second grandchild, Sasha Lillian Bari Osmond, the second child of his daughter, Lauren, and her husband Mark, was born on June 22, 2017. 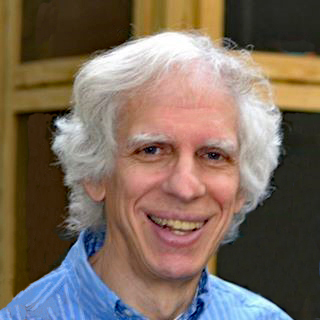 Like the majority of the WTC responders, engineer Marty Cervellione of the city’s Design and Construction Department developed respiratory and gastric reflux in the early years after the attack. He spent Sept. 14-Nov. 15, 2001, at Ground Zero, while the fires burned and toxic smoke hovered over everyone. My dear friend Eileen Cornella Caruso died .....I HAVE TO SAY GOODBYE...I DONT KNOW HOW TO LET GO. Eileen and I met in High School and were both 15-years-old, and that started our journey in life together. We both had boyfriends and double dated and had great times together. We shopped at Roosevelt Field and had pizza and a soda for lunch. We both agreed that whatever clothes we bought had to make us look older and in style. Then it was time for our senior year and the all the events that come with that. I can still remember the senior year car brigade. I was in Eileen's convertible car and her boyfriend was named Jimmy and the radio was playing "Jimmy Mack, when are you coming back". Oh yes, Eileen and I have history together. Eileen came to my wedding (I was first to do that) and then I went to Eileen's wedding. Eileen then bought a house (Eileen was first in that). I followed afterwards, buying a house in Deer Park where Eileen lived. Eileen then had Christopher (Eileen was first in that). I followed with Peter and Rebecca. We had many good times getting together with husbands and having dinners out and later playing board games. Do people still play board games? We had girls’ days out and of course we went out to lunch and shopping. But now the clothes we bought had to make us look younger and thin. We went on some family vacations together with the children. One that was special for me was the time we went to Rocking Horse Ranch. The kids took off skiing, but you and I decided that skiing wasn't for us. So we dragged a sled halfway up the small mountain and attempted to sleigh ride down. We thought we were going at the speed of light giggling and laughing all the way, with the kids watching us with bewilderment at the faces of the two grown women giggling away. For those few fleeting moments Eileen and I were teenagers again. This is part of our History together. Eventually came grandchildren into our lives. I was first in that one, then Eileen followed. We both agreed that grandchildren were such a joy and would share stories with each other of what the grandchildren had done and said. This is all part of our journey together. We then shared all our medical issues some small, some large, some solvable, some you learned to live with. Now comes the last part of our journey, our history, your battle with cancer. Eileen you died ...I HAVE TO SAY GOOD-BYE AND I DON'T KNOW HOW TO LET GO..... Our friendship and journey in life lasted longer than many marriages do, and now I have to go on the journey without you, and I am now the keeper of these memories. What comes to mind now is Bob Hope who entertained the troops for half a century and always ended his tour with this song: "Thanks for the Memories." I dedicate that to you, Eileen. Steve is gone. He and I were super close friends, probably since 1st grade. After all those years of Northside and Wheatley, but still not always in the same classes, it was one of those cosmic moments when we received our class ranking during senior year. Steve and I were TIED FOR THE SAME EXACT place in the class (not a ranking that was particularly brag-worthy, I might add). Another one of our cosmic moments happened during the class picture in, I think, it was 8th grade. Without prior consultation, Steve and I showed up for the class photo in the exact same sweater that each of us had received for a bar mitzvah gift, or something. There we are in the front row, the two of us, with the matching sweaters on. He and I (along with Rob Levine) made a very trendy movie for our senior year project (the soundtrack was Moussorsky's "Pictures at an Exhbition"). It was called "Beanie & Clyde in the Last Supper." A short apocalyptic tale with some bean-eating hippies. We made it at my parents' house (and made quite the mess) on the day of the Super Bowl (when they actually played those things in January. I think it was Super Bowl II). We showed that movie (now on DVD, of course) during our 40th Class Reunion in May, 2008. The last time I was in touch with Steve, it was just a couple of days before his passing. He said he did not feel well and was battling a case of the "flu." Indeed, this turned out to be a terrible misread of what was ailing him. So it was probably avoidable. Now, another strong connection relegated to the compartments of personal memory. It is with a very heavy heart that I share the passing of our friend, George (Gigi) Poulos. As some of you may be aware, Gigi was experiencing serious health issues. It is a bitter irony that we will memorialize Gigi on Monday, March 27th, his actual Birthday - when we were going to celebrate his life this Saturday, March 25th, at Roslyn's "Chalet". Gigi grew up on Bengeyfield Drive, East Williston. It was there that he met many of his neighbors, lifelong friends and lifelong crush. At various times in his life he lived in East Moriches, LI; Sutton Place, NYC; The Hamptons; and, finally, Freeport. “East End Gigi” promoted rock band events. “GIGZ” promoted travel events. He traveled to Barbados, St. Thomas, Jamaica, putting together all the advertising and promotion – pre-dating social media. Gigi, the certified Marine Technician earned an excellent reputation amongst friends where he lived (Freeport) and where he played, “The Chalet”, Roslyn. This vocation was well suited to him as he loved, and lived near, the water. Gigi, lover of off trail motor biking, was a lifetime member of NETRA (New England Trail Rider Association). He looked forward to their events and practiced in advance of them. Recently, a group of Wheatley friends met for brunch in NYC. Gigi told stories of his childhood. He spoke of the gratitude he felt for how hard his parents worked to move the family to his home on Bengeyfield, the upbringing it gave him, the education he received at Wheatley. As an adult, Gigi was a ‘shirt off his back’ friend. When confronted with someone homeless, he gave to them. When asked to work on a boat, he would assess if that person needed a financial break and undercharge or give them a freebee. He was generous and generous of spirit. At one of our earlier reunions, Gigi’s best pal, Gary Cervellione, wasn’t doing very well. Gigi had his arm around Gary’s shoulders, hugging him, kissing him, and saying: “you see this guy, I love this guy”. Genuinely caring about a friend was deep in his DNA. Gary passed shortly after that. As a kid, Gigi had a severe crush on Maria (Ria) Balducci, also from Bengeyfield Drive. He was fortunate enough to ‘couple’ with Ria later in life. Tragically, Ria passed at an early age not too long after Gary. Gigi was there for her until the end. Now that life has handed us this curveball, we’ve all been sharing Gigi stories: The elementary school tollgate thug: if you wanted to pass to get to the park, you had to pay. Gigi the grade school hellion - getting into all kinds of trouble with his best friends, Gary and Gregory Cave. The young man whose first girlfriends made out with him behind the tracks. (By the way, there were two that shared that detail). Gigi the decent, kind, friend. Gigi was the picture of health at Wheatley’s 50th Anniversary (2006). But his situation took a turn for the worse around the time of Super Storm Sandy (2012). On Monday, March 20th, 2017, following a battery of harsh tests, Gigi had good news from the doctor. He called me and was quite excited. I was on board to help him organize his 61st Birthday celebration at The Chalet. Gigi said he wanted to make it to his 81st Birthday. 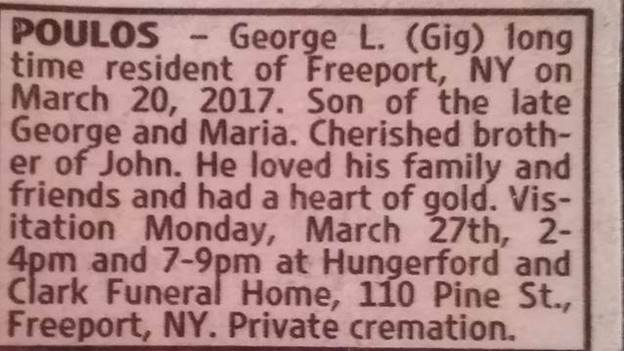 It’s a bitter irony that his death notice was sent immediately following the party invitation – Gigi had passed that same Monday night, quietly at home. Gigi is survived by his brother John. George Louis Poulos: Born March 27th, 1956 – Departed March 20th, 2017. Gigi was the magical stuff stars are made of. Let’s wish his star farewell, wish that it shines brightly and hope he’s biking a perfect trail, up to mischief with Gary and enveloped by Ria. Susan wrote me as follows: “I saw an article in today's New York Post that really sparked my interest. It was about Laurie Kellogg, whom you ordered to be released from prison. The reason this interests me is because in many ways it mirrors a case my son, Ross Firsenbaum, took on pro bono as a young attorney working at the Wilmer Hale law firm (where he is now a partner). In Ross' case the person was Dewey Bozella who had been in prison for 26 years, accused of a murder he did not commit. And like Laurie Kellogg, Dewey was denied parole because he did not show remorse for the crime. His claim was that he did not do the crime so he could not feel remorseful for it. When Dewey was up for his last parole hearing (the 4th one I think it was) Ross brought in people to testify on his behalf as to his character and even had him examined by a notable psychiatrist from Harvard who said he was completely reformed and not considered a threat to anyone (according to Dewey, he was no saint, but he was also no murderer). Still, the parole board denied him parole. Ross continued to fight for Dewey and tried to show how he was unfairly tried and convicted and how the police and prosecutors involved held back information that likely would have persuaded a jury that someone else had committed the crime. Rather than going through a 3rd trial (Dewey had already had 2) the judge sided with Ross because there was no longer any evidence (most was lost or destroyed) to try Dewey again and the prosecutor's office felt it wasn't worth going at it again. Dewey was released and the story continues with him having the professional boxing match that he dreamed about all those years he was incarcerated, trying to lead a normal life, teaching boxing to young people and going on to accept a settlement of $7.5 million in a civil suit against the City of Poughkeepsie, brought by Ross, who also did this on a pro bono basis and never received any payment but gained tons of respect and self-satisfaction knowing he helped someone who was unfairly tried, convicted and spent a major portion of his life locked away for something he didn't do. It is quite a story and told in Dewey's book, Stand Tall: Fighting for My Life, Inside and Outside the Ring. There were also two televised videos about Dewey and what he went through in trying to regain his freedom and how he struggled to land the pro boxing match, and Ross was in both. I am a very proud mom whose son could not have turned out better and who gave his parents 3 beautiful grandchildren who I hope will one day join their dad in the practice of law. Peer into the future with me to imagine Europe in the year 2022. President Marine Le Pen. Prime Minister Jeremy Corbyn. Another military coup in Greece. The rise of fascism in Hungary. A Second Yalta Conference, where the West once again cedes control of Eastern Europe to Russia. The collapse of NATO and the EU. In "The Plot Against Europe," my latest article for Foreign Policy, I chart out a dystopian scenario of a continent in crisis. But how far removed from reality is it? I try to answer these questions in my new book, The End of Europe: Dictators, Demagogues and the Coming Dark Age, which Yale University Press published. You can buy it here. Read what Josef Joffe, editor of Die Zeit, calls "pedagogy with a fierce moral message...a masterly portrait of a continent in its deepest crisis since World War II. The book is compulsory reading for anybody who cares about Europe." Related events are scheduled for Vienna, Bratislava, Brussels, Amsterdam, Berlin and New York, about which more information can be found on my newly updated website. Thanks for reading and I always appreciate your feedback. In the small world department, when I started graduate school back in 1987 I answered an ad to rent a room in an apartment on the Upper West Side. Turns out it was a room in the lovely apartment of one Arthur Engoron, now “Your Honor” to us plebes, where I lived very comfortably for a year. I don’t recall how long it took us to figure out that we were both Wheatley alums, but figure it out we did, and here we are 30 years later, and I’m writing a blurb in Art’s Wheatley newsletter. Is it my imagination or have the 37 years since I graduated Wheatley, in 1980 (to help you with the math), just zipped right by? There were four years in college, I’m pretty sure. Yale in the early 1980s was very much a blur, perhaps because of my emphasis on the latter half of the formula, “study hard, party hard.” A couple of years in California deciding between becoming a writer or going to graduate school, which ended in my living in Art’s apartment while attending Columbia for a Ph.D. in philosophy. Ten years of teaching at Kenyon College in Ohio while married to my first wife, followed by an amicable divorce, a new wife, a move East, and now some 13 years teaching at Connecticut College. Oh, the second wife has also produced three boys with my help, or more accurately, one large and loud boy with six arms and six legs (now ages 11, 9, and 8). It’s pretty clear that I was blessed with this enormous child-monster as payback for the torture I inflicted on my parents growing up. As John Lennon put it, instant karma got me. Have had my share of mid-life crises. The first divorce; transition to Connecticut, that was definitely one. Then a few years ago realizing I still rather wanted to be a writer. So in 2014 I published my first novel, called The Second Daughter, under the pen name J. Jeffrey. (Read the book to find out why the pen name!). Then just last month I published my second novel. Called The Irrationalist, it’s an historical murder mystery based closely on real events: the sad and tragic life, and mysterious death, of the famous philosopher René Descartes. It’s a mixture of mystery and suspense, humor and emotion, with a secret (true) love story at its core, set against the backdrop of one of the most compelling periods in history, and with one of those surprise endings that make you go back and start re-reading from the beginning. I’m pretty proud of this sucker, so I hope you’ll check it out: http://www.andrewpessin.com/Site_2017ff/The_Irrationalist.html. So those were a couple of mid-life crises. At 54 years old, however, I’m pretty sure I’ve already passed the “mid” point. I find myself increasingly nostalgic about the old high school, maybe because I’m starting to find it easier to remember things from the 1970s than anything that’s happened since. Would love to reconnect with anyone who knew me back when, unless I owe you money. Please feel free to send an email: andrew.pessin@gmail.com. Thanks for keeping this lifeline going … it is much appreciated. The Class of 1967, Wheatley’s largest ever (at just over 250 graduates), held a 50th-Year Reunion over the weekend of May 19-21, 2017. The main event was Saturday Night, at the Wheatley Hills Golf Club, in East Williston, also the site of the Class of 1960’s and 1963’s 50th. You can read all about it, and link to scores of photographs, at http://www.wheatleyalumni.org/Blogpost/Blogpost-57-20170614.html.